Considered the founder of modern circus, Philip Astley, a former Sergeant Major and veteran of the Seven Years War, brought popular entertainment to London’s South Bank in the late 1700s. With the disappearance of court theatres, venues quickly had to survive in a commercial world and Astley brought in the crowds with a popular mixture of clowning, trick riding and acrobats. By the mid-19th century circus, both touring and in built venues, was firmly established with audiences nationwide. In 1844 the railway arrived in Great Yarmouth, heralding the birth of its Victorian tourism boom. Only a year later, the circus came to town as Cooke’s Equestrian Circus erected a ‘wooden structure’ on Theatre Plain. It was from this circus that Nelson the clown performed his ‘foolish exhibition’ that led to the 1845 Suspension Bridge Disaster. Drawn in a tub by four geese up the river, thousands gathered on the riverbank and bridge to watch the feat. The bridge collapsed leading to deaths of 79 people, many of them children. Cooke’s Circus left shortly afterwards, but returned briefly seven years later. Between 1866 and 1874, a theatre built on Regent Road by Mr J Isaac had various circuses perform, including American circus Howes & Cushing, before it was demolished. In 1876 a building was erected temporarily on Skinner’s Meadow on the corner of Nelson Road and was probably demolished the following year. In 1878 W&G Pinder’s Circus visited and built a new circus on the site. Intended to be a long term establishment, this too was demolished the following year, the land acquired by the Yarmouth and North Norfolk Railway Company to build the Yarmouth Beach Station. A circus was subsequently built on Victoria Road a few years later in 1881. Hired by various visiting circus companies, it had gone again by 1885. This swift coming and going of circus and other theatre buildings was fairly common across the country at the time as they fell victims of fire, failure or rapid urban developments. Travelling circuses and their entourage of visiting showmen have continued to visit Great Yarmouth throughout the centuries, originally bringing with them animals as well as acrobats until the early 1980s. Many have put down roots in the area and now run static attractions to entertain visitors. 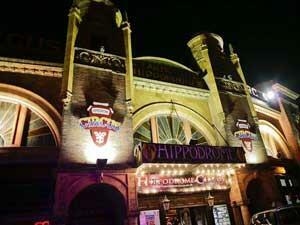 Built by showman, George Gilbert in 1903 the Hippodrome has remained a consistent presence on Great Yarmouth’s seafront. Reputedly Charlie Chaplin and Harry Houdini graced its ring (one of only four in the world with the famous water feature). Closing only briefly during World War II, when it was used by the RAF as a shooting range, the venue was taken over by current owner, Peter Jay and his father in the late 70s. Peter Jay's son, the current Ringmaster, Jack Jay, presides over the modern vision of circus, with light shows and pop music, with shows during the school holidays at Halloween, Christmas, Easter and from July to September over the summer months with performances daily from an international troupe of artistes. In 1999 SeaChange Arts presented their first circus show, ‘The Ring Cycle’ at the Hippodrome. This was just the beginning of a growing focus on circus and street arts projects. Then in 2008 the Out There Festival made its debut, bringing a programme of exciting, innovative international circus to thousands of people in the streets, parks and venues across Great Yarmouth. In 2012, SeaChange Arts moved in to the Drill House, previously the Drill Hall. Built in 1867, the Grade II listed building is the former home of the 2nd Volunteer Battalion Norfolk Regiment. After an exciting £1m redevelopment, the Drill House is a dedicated circus and street arts creation and training facility with various events and shows on throughout the year. Summer Spectacular & Water Show features acts from around the world in Britain's only surviving complete circus building.